How much longer will this be around? 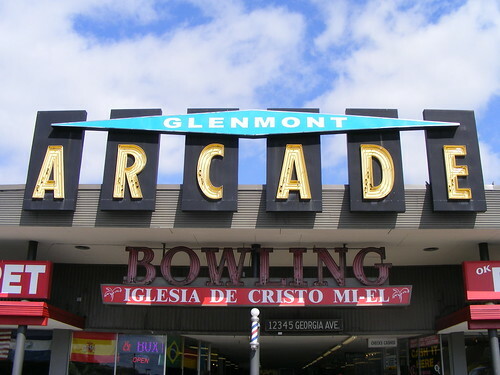 With its distinctive sign, the Glenmont Arcade was a local landmark and an emblem of Montgomery County's suburbanization after World War II. But as the county prepares to redevelop Glenmont, will it still have a place in the community? Located in the Glenmont Shopping Center at Georgia Avenue and Randolph Road, the Glenmont Arcade is like a little mall-within-a-strip mall. 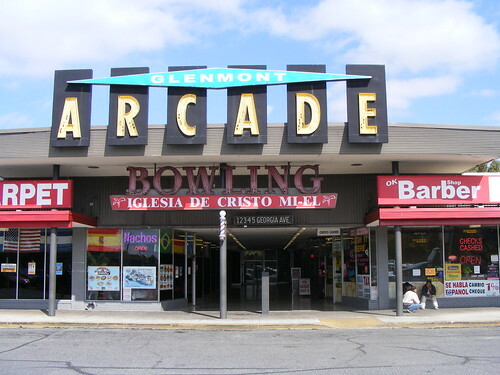 The arcade was built in 1952 by the Glenmont Land and Development Company, which built many of the surrounding residential neighborhoods. It was the first part of the Glenmont Shopping Center, which was completed in little pieces over the following decade. 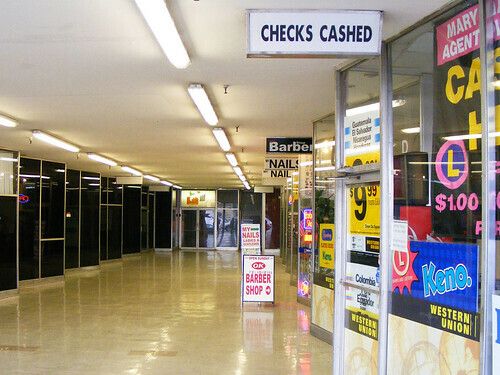 The arcade consists of a short, enclosed hallway lined with shops that ends at the entrance of a bowling alley, a beloved local institution that closed in 2002. Unlike a mall or other arcades where the shops are placed in a straight line, each of the shopfronts are angled towards the parking lot, so you can see what's inside without actually having to go inside. According to this 2001 study of the site's history, the arcade originally contained 11 "one-person businesses" in small shops. 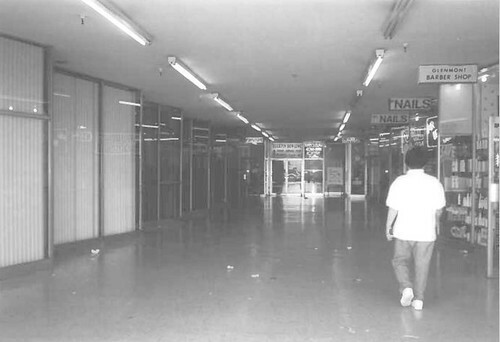 The Glenmont Arcade in 2001. Photo from Anne Bruder, Maryland State Highway Administration. Though I've lived in Montgomery County most of my life, I'd never actually been to the Glenmont Arcade before last weekend, when I talked to Scott Whipple, a historic preservation planner at the county's Planning Department, at their open house. He's particularly interested in commercial areas from the mid-20th century, like the Flower Shopping Center in Long Branch, which is currently being studied for preservation. "It's not often that we get to do something like that," he said. There aren't many remaining examples of architecture from the 1950's and 60's; many buildings have either been torn down, remodeled beyond recognition, or under constant threat from the wrecking ball. One of them is the Glenmont Arcade, which could be demolished under a new plan the county's working on. Unassuming as it may seem, the Glenmont Arcade comes from a long line of shopping arcades, which first originated in Paris over two hundred years ago before coming to the United States at the turn of the 20th century. They first appeared here in 1925, when the Chevy Chase Arcade was built on Connecticut Avenue in the District. Arcades also served as the inspiration for modern shopping malls like Wheaton Plaza, which was built 7 years after the Glenmont Arcade, and other strip malls around the country. Inside the Glenmont Arcade today. Stepping inside the arcade feels kind of like a time capsule. There are linoleum floors, bright-white and shiny, though they replaced the original terrazzo floors. Fluorescent lights reminiscent of a high-school cafeteria hum quietly. There's an old address sign (for "12345 Georgia Avenue"), which appears to have been hand-painted and a barber pole rotating slowly outside the barbershop that's been there since the arcade opened. Nonetheless, the space has seen better days. The bowling alley was eventually replaced by a church, which papered over their entrance; all of the shops on the left-hand side were combined into one restaurant, which also papered over their windows. And the two storefronts at the very back, which were probably the most sought-after spaces when next to a busy movie theatre, are now both empty. There are no people in the arcade, save for four teenagers hanging out and smoking, and the occasional customer walking from a check-cashing place out to the parking lot. Outside, I try to take a photo lining up the Glenmont Arcade sign with the water tower a few blocks away, when I'm approached by a guy wearing oval-rimmed glasses and three coats. He asked what I was doing. "I like the sign," I replied. "Yeah, it's a nice sign," he said. "It's a shame what happened to the Arcade," he adds, voice trailing off as he shuffles away. Men hang out in front of the Glenmont Arcade, which has seen better days. The Planning Department is currently working on the Glenmont Sector Plan, which will chart a course for turning Glenmont's business district around. However, the Planning Board chose not to study the Glenmont Arcade for its historical merit. Since the Glenmont Shopping Center was built in several pieces, it's broken up into 15 different lots and has 13 different owners. That will make both redeveloping the shopping center hard, but preserving any part of it even harder. The arcade itself has just one owner, Greenhill Capital, a Bethesda-based company that owns a third of downtown Wheaton. There are no current plans for redeveloping the Glenmont Shopping Center, though Greenhill may be sympathetic to calls for preserving all or part of the arcade. Company head Lenny Greenberg, who I interviewed earlier this year, has stressed the importance of preserving Wheaton's local culture. When he redeveloped the Anchor Inn, a once-popular restaurant there, he chose to save the 1950's-era sign. Whipple told me that there's "nothing like" the Glenmont Arcade in Montgomery County, and he's right. As he wrote in a recent blog post, it's better to "reuse buildings than to throw them in the trash." Do we have to throw the Glenmont Arcade in the trash to improve this community? We won't know unless we give this building a fair shake and at least study it for historic preservation. Check out this slideshow of the Glenmont Arcade, then and now. Great post - thanks for bringing some attention to this rather intact mid-century modern gem. It'd be a shame to see it altered or torn down. As an aside, I was just thinking the other day about the old Hechinger that was next door to there. I drive past that arcade occasionally and always thought it was an actual arcade, with video games and that kind of thing. The 13 year old in me is a little sad it's not! Don't feel bad - I used to think it was an arcade too! I grew up there in the 1960s. Are you aware that there were TWO bowling alleys? The duckpin alley was underneath the parking lot and you got to it through the back glass doors and stairs that followed. And... if you went down a little a to the back - away from the duckpin side, there was a 10-pin alley as well! It was a magical place to a small child way back then (ca. 1965).